Small is beautiful, but big is necessary. In Pakistan, India and Bangladesh, many development practitioners live by this creed. With such huge populations, often crowded in the world’s most populous cities, this group converses casually about the magnitude of needed coverage and reach that many countries’ presidents would, justifiably, have trouble fathoming. Yet even with so much to talk about, at last month’s Frugal Innovation Forum: Scaling Simple Solutions, everyone agreed that they don’t get nearly enough opportunities to talk shop and compare notes within the region.Taking place in Dhaka from March 30-31, the forum was the first ever gathering of South Asian development practitioners, hosted in South Asia, specifically to talk about scaling frugal innovations. Nowhere is the importance of innovation more apparent than in quickly-changing contexts like that of South Asia: many villagers are migrating to cities and abroad, women are increasingly entering the workforce, there is a youth bulge, while with increases in life expectancy, the fastest-growing demographic is senior citizens. The complexity and inter-relatedness of these problems requires more than just new strategies: It requires new paradigms of understanding the situation, thinking holistically about ecosystems and interacting parts, and above all, how to create models with enough flexibility to evolve. South Asians, perhaps due to the unique environmental factors of the region, seem to have an innate predisposition to what we might call the “jugaad”, or frugal innovation, mentality. 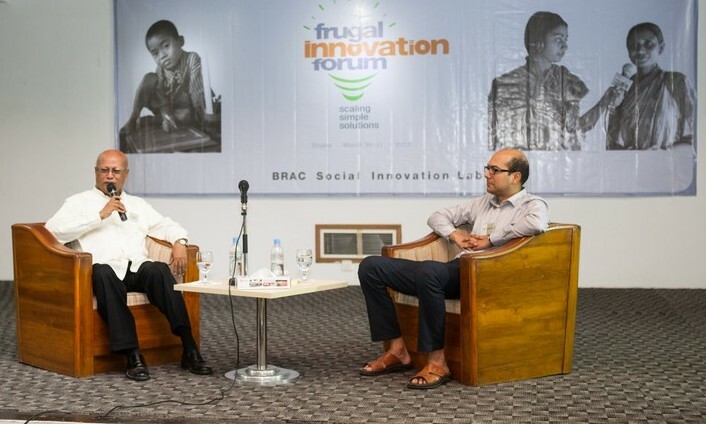 This was one of the core beliefs that led BRAC to organize the forum in the first place: that there are unique innovations springing up in largely isolated conversations across South Asia that would lend themselves to further scale and adaption around the region. Jaideep Prabhu, co-author of Jugaad Innovation, spoke about the importance of this in his opening remarks at the Frugal Innovation Forum. But it’s easy to pay lip service to the need to learn from one other, but actually how one does that is not entirely understood. Rarely can a ready-made model be dropped into a new place. Even the process of creation is hugely important in developing a sophisticated understanding of not just what works, but why it works. Innovations in processes are often underappreciated but of crucial importance. The biggest and most successful organizations rarely owe their success to a product, but rather their activities and capabilities. “Big impact” mentality is a must. 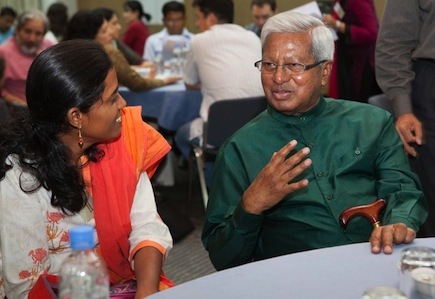 In his closing remarks, BRAC’s Founder and Chairman Sir Fazle Abed told the participants, “many organizations are happy with results on a small scale. We need to be more ambitious.” There are plenty of challenges on the path to scale—don’t let your mindset be one of them. To go fast (and burn out quickly), go alone. To go far, go with others and forge a better path. The days of operating in a green field with no regulation or government engagement are gone. Increasingly, the challenge in development is building capacity for effective, independent action—of communities, of organizations, and of policymakers. Nurturing ecosystems that are inclusive, which embrace innovation and value development is the only way to sustainably tackle poverty. Asif Saleh is the senior director of BRAC Strategy, Communications, and Capacity. Maria A. May is the programme manager of BRAC’s Social Innovation Lab.